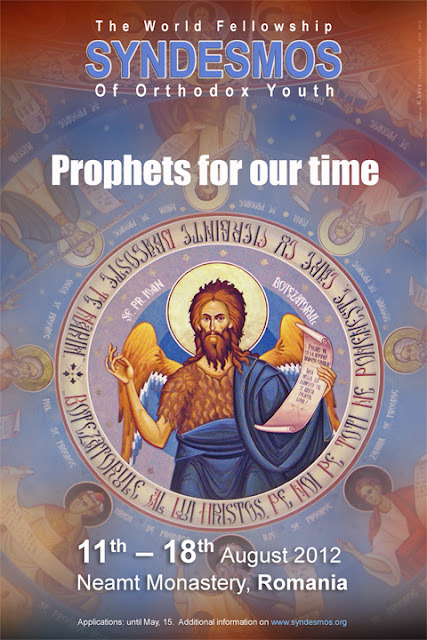 The theme of the Syndesmos 2012 Neamt project is “Prophets for our time”. There are several reasons why we have chosen this theme: it connects Old and New Testament, it refers to prophetic figures of the 19th and 20th centuries and because the very existence of Syndesmos and its activities over the last six decades have had a prophetic aspect. At the end of the festival, participants will leave with another look on prophets and especially on each person’s own role to play in the life of the Church. The programme consists in conferences, discussions, prayer as well as informal times like an excursion in Neamt area and an intercultural evening. Participants will have the opportunity to experience the unity of the Church, sharing their faith and the joy of being together. His Eminence Metropolitan Josif of the Romanian Orthodox Metropolis of Western and Southern Europe will participate in this event as a keynote speaker. Venue: Seminarul Teologic Neamt (http://semmnt.ro) near Neamt Monastery. Airports: Bacau, Iasi, Targu Mures, Bucharest, Cluj-Napoca, Timisoara, Arad. Bursaries may be available on a case by case basis, on application to the preparation committee (neamt2012@syndesmos.org). N.B. This amount includes: food and accommodation at Neamt Monastery. It does not include: transportation from and to your home country, visa costs and insurance. Feel free to print the poster of the event, downloadable as a pdf : Black&White or Color. More on facebook to like and share : http://www.facebook.com/SyndesmosFestival2012 !